Here are a few of my current projects. There are 4 Kenmores, a Riccar and one White (with "Janome" on it's cord). If you can't tell, I have a thing for old Kenmores. These old Kenmores all have the oscillating hook system, and they were just made well. My Husband and I find these machines at the thrift store. They cost anywhere between $8 to $20. When I get them fixed-up, I can sell them for $50 to $100, and give someone a descent machine that will work well for a long time. And I get some great practice! The Riccar is such a solid machine! It's only a straight/zig-zag, but was made when Riccar was Bernina. I was pretty excited about that one! What I look for when I buy a machine from the thrift store is #1 an oscillating hook system (it just makes the best quality stitch); #2 does it have it's hook, bobbincase and retention ring; #3 does it have the electrical in good condition. Sometimes I'll buy a junk machine just to get the foot control. You'd pay at least $30 for a new one, so paying $10-$15 for the whole machine is alright. What to beware of? #1 a drop-in bobbin (I just don't like the stitch quality, and won't buy or sell them); #2 a needle bar that has forward/backward wiggle. It needs to wiggle side to side, but not forward and backward. If it wiggles forward/backward, you can't control the needle/hook distance, which is kind of an important timing setting; #3 an off-brand machine with missing parts; #4 has the machine been dropped; #5 are there any damaged gears? 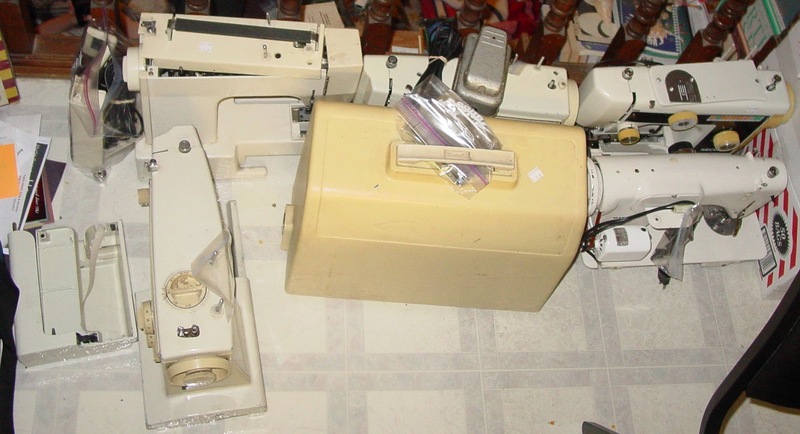 My best find so far, was a Bernina 801 (minimatic) for $75, that I fixed-up and sold for $150.